The Liebert GXT4-8000RT208 offers true on-line power in a convenient rack configuration. The Liebert GXT4 UPS 8 and 10kVA units offer a flexible solution for protecting rack-mount equipment, including VoIP and PoE. Specifically designed for use with the new generation of high power switches, these compact UPS systems pack 8kVA (7.2kW) or 10kVA (9kW) of power into a 6U rack/ tower package with flexible output voltage and optional output distribution. 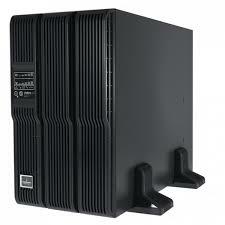 The UPS includes built-in, replaceable batteries for up to 5-8 minutes of runtime at full load depending on model. The UPS has a dual inverter design, capable of providing 5 output voltages of 240/120, 208/120, 230/115, 220/110, or 200/100 and an output power factor of 0.9. The 6U size is the smallest for 208/120 selectable voltage in the 8-10kVA model range. The unit features integrated internal automatic and manual maintenance bypass, power module, battery modules, and optional plug-and-play distribution plates. The standard 8 and 10kVA models include terminal blocks for hardwired connections of both input and output. Optional power distribution modules (PODs) are available to add output receptacles to the rear panel of the unit. Offering user-replaceable operation the Liebert GXT4 UPS 8 and 10kVA units feature three bays for one power module and two battery modules. The chassis contains a bypass switch that allows all modules to be removed without powering down the connected load. Frees up time-strapped IT staff by managing and tracking UPS health, maintenance and service. Reduces the worry of critical equipment downtime. Ensures rapid recovery in the event of failure within 24-48 hours. Frees you from the responsibility of handling and documenting the disposal of hazardous materials, like batteries.